July 2014 - Contemporary Controls recently published an article in AutomatedBuildings.com about the shift to IP video surveillance. The shift from analog to digital technology has created opportunities for a new way of thinking of how security systems are installed. One of the many benefits of IP video surveillance technology, compared with traditional analog video equipment, is that digital video is compressed and run across standard Ethernet networks using IP which is the same protocol used in corporate networks and the Internet. Developing an IP surveillance system can be simple and cost-effective. However, there are some technical requirements to consider when installing an IP surveillance system, or transitioning from an existing analog system to a high-functioning IP surveillance system. Considerations include network bandwidth and latency, network features and capacity, wired or wireless and more. Network switches make it easy to increase the bandwidth capacity of a network simply by adding switches/routers. Some switch technologies can also optimize bandwidth usage. 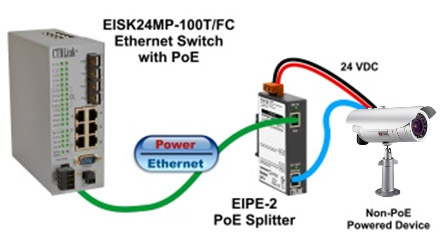 Power over Ethernet (PoE) technology is ideal for IP surveillance systems. Read more at IP Technology Fuels Growth of Video Surveillance.